I tend to stick to a somewhat limited palette when producing items for myself, so I am trying to extend the range of colours I usually work with. My preference seems to be for the strong reds, purples, pinks and blues that come from madder, woad, indigo, cochineal and logwood. So for a change I decided to aim for a rich medium brown that I hoped would provide a pleasing contrast with some indigo-dyed wool I had earmarked for a jacket. Walnut hulls seemed a reasonable choice of dye and I knew I had a container full of sludge from the fresh green walnut hulls I had collected and processed last year. Fresh green walnut hulls usually give much richer browns than dried hulls and when I used this sludge last year I achieved lovely warm shades, so I was full of enthusiasm. I used unmordanted handspun wool and set up the dyebath. First, I simmered the sludge in its accompanying liquid (plus extra cold water) for about 45 minutes to extract more colour. Then I strained off the dye solution and added more cold water, plus some oak bark solution to increase the tannin content, as this can improve the depth of colour from walnut hulls. The wetted skeins were then put into the dyebath and gently simmered for about an hour, before being left to steep as the solution cooled down. However, when I inspected the colour on the skeins it became clear that I wasn’t going to achieve the depth of colour I wanted – instead a mid greyish brown (typical of the shades from dried walnut hulls) seemed to be the result. I was still determined to aim for a rich warm brown, so I decided to add some madder extract to the walnut solution, in the hope that adding some red would produce the colour I wanted. I mixed about a teaspoon of madder extract to a paste with hot water, removed the skeins from the dyebath and stirred the madder paste into the dyebath, then returned the skeins to the pot. 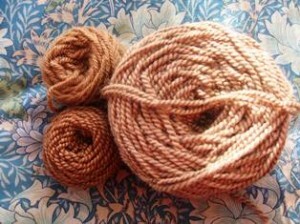 To my surprise, the (unmordanted) skeins almost immediately became a purple colour, not the rich brown I was expecting. Then I remembered this had happened before several years ago and I had assumed at that time that it was just one of those strange results that would never be repeated. I had also made a dyebath from oak leaves and oak bark, as I wanted two slightly different shades of brown, and I had added madder extract to this dyebath too. This time the skein became a rich pink/purple. 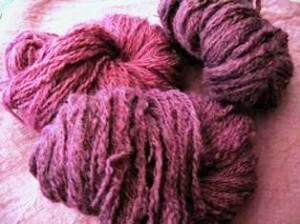 Both the purple and pink skeins retained their colours after they had been washed and rinsed. So how do I account for these unexpected results? Well, leaving aside the possibility that some mysterious colour spirit had decided I am destined to work always with the same colour palette, I can only assume that the tannin in the walnut hulls and oak leaves and bark reacted with some pigments or chemicals in the madder extract to produce these purple colours. Perhaps the madder extract contains elements from the processing that are not present in madder root, so now I need to try out this combination using madder root, rather than extract. If this does not produce these purple colours, then the assumption would probably be that something present in madder extract , but not in madder root, was the cause of the purple colours. If anyone has any other ideas as to how and why these purple colours resulted from these dye combinations, please let me know!